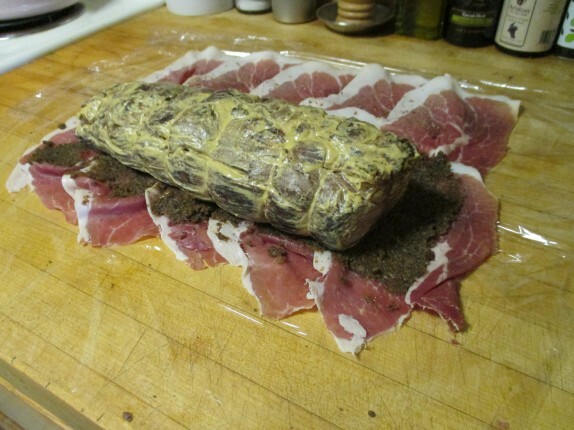 I finally mustered up the cash to throw down on a nice piece of beef tenderloin to use for beef Wellington. I’ve seen a number of preparations over the years, but it always seemed far too difficult. As it turns out, it’s pretty simple, and I have a few comments and took a few pictures as I prepared it. For a decent look at the technique, I’d urge you to watch this video before you start. Wellington is something that Gordon Ramsay keeps on many of his restaurant menus, so he’s obviously a great resource. The very first step is shopping for ingredients. You could make your own puff pastry, but that doesn’t seem like the type of activity I would have fun doing, and will make this whole preparation infinitely more complicated. Once you have everything in hand, you need to sear the beef. You could do this in a heavy pan or in an oven (that’s how I seared mine, along with a coating of olive oil and dusting with cracked pepper – no salt). I had the butcher who cut my tenderloin tie the beef at regular intervals. This helps to keep a uniform diameter. 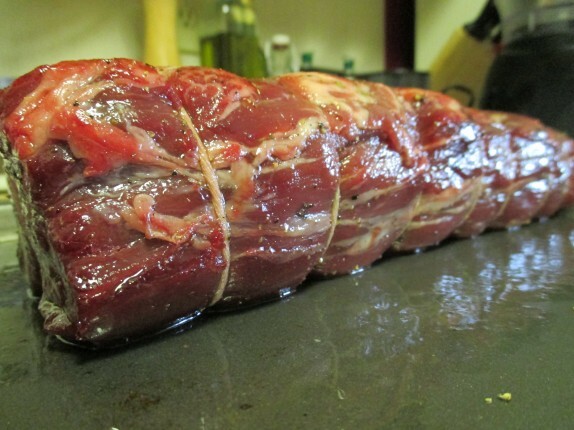 Once it was seared, while hot, I removed the string and brushed the tenderloin with Dijon mustard; this is for seasoning and for some acidity in the tenderloin. 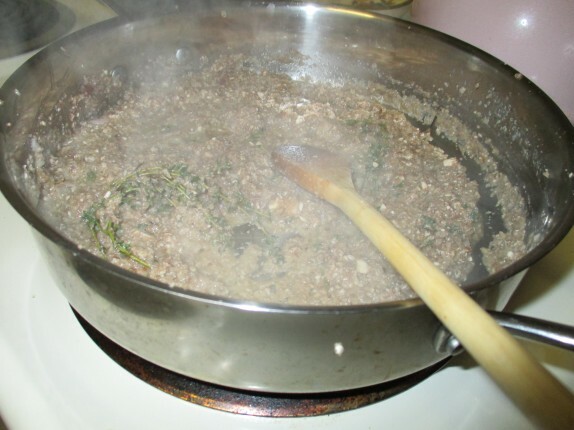 As the beef cooled, I worked on the mushroom duxelles. 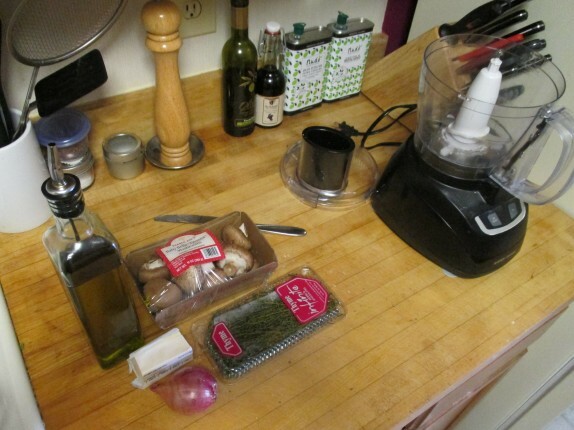 For mine, I used the food processor to get my crimini mushrooms and shallots down to small bits. Then, I cooked all of the water out of this mixture in butter and olive oil (with some fresh thyme), deglazed with wine, and cooked it down until it became a paste. 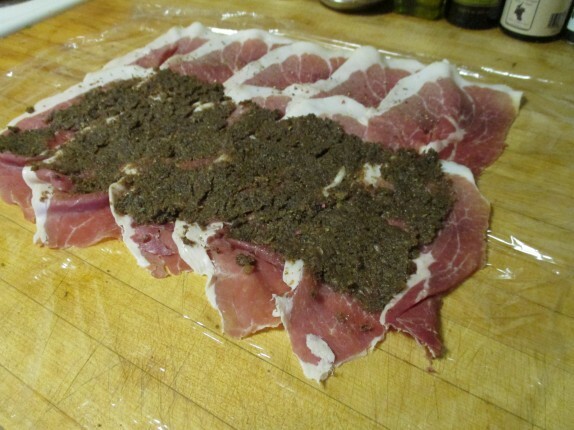 I adjusted the seasoning at the very end minimally, since there would be lots of proscuitto around the whole thing. I allowed the duxelles to cool in a bowl. 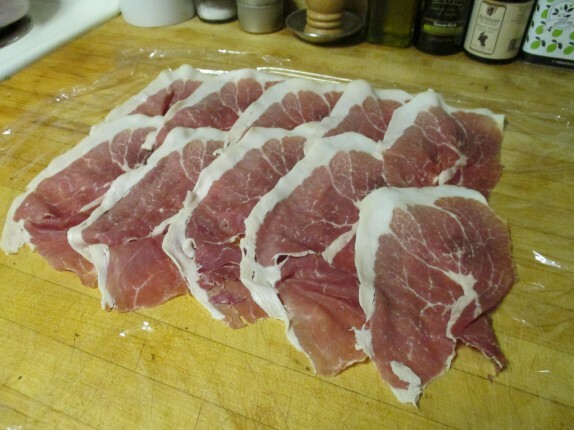 I took a lot of care to make sure the proscuitto was tight around the tenderloin. The plastic wrap was instrumental in making this so. The wrapped bundle sat in the fridge for a while. Maybe an hour or two. I’ve read that this can chill out for up to a day. That’s cool because, if you’re making this for a party, you could totally do everything up to this ahead, and finish the next few steps while enjoying your company. 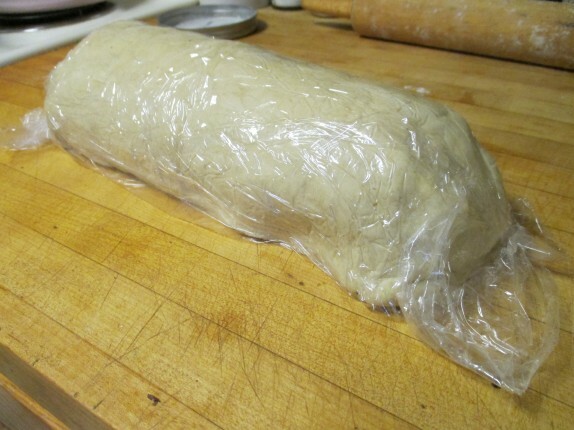 When I was ready to bake, I rolled out my puff pastry, and rolled the beef in the pastry (again using plastic wrap to aid in making the bundle as tight as possible). 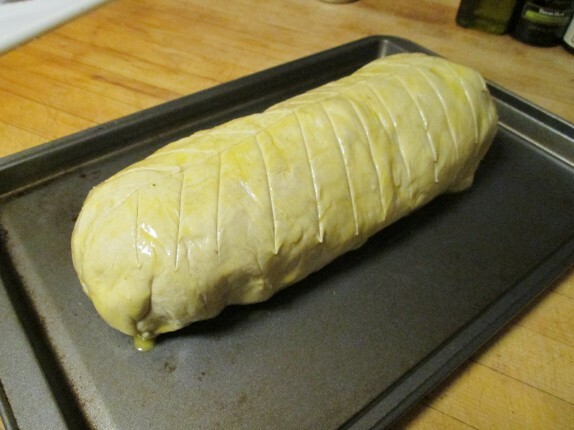 Beef Wellington ready to bake! 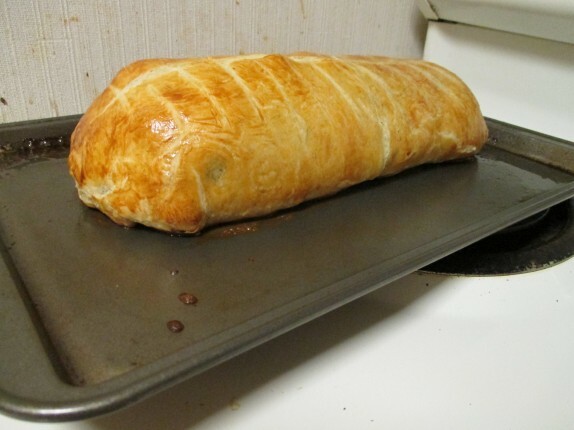 I had the oven preheated, so I brushed the Wellington (puff pastry seam down) with some egg yolk (for the rich golden color), and cut a cute pattern into the top. I allowed it to rest before slicing for service. It was absolutely amazing, a true classic. 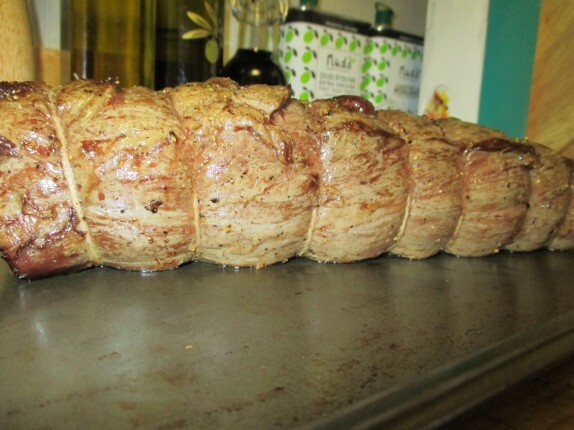 As far as cost, a 2.5 lb piece of tenderloin was $50, Enough proscuitto to wrap it was $15 (just under a pound that the guys at the Meat House sliced waaaaaay too thick), puff pastry was $5, and the mushrooms were $5. And with this monster, I could have easily fed at least 6 or 8 people if I made some stuff on the side. I think the real trick to the whole preparation is to use a minimal amount of salt throughout the preparation. Salt is great for seasoning, but it also serves to promote osmosis (diffusion of water) out of fresh meat. 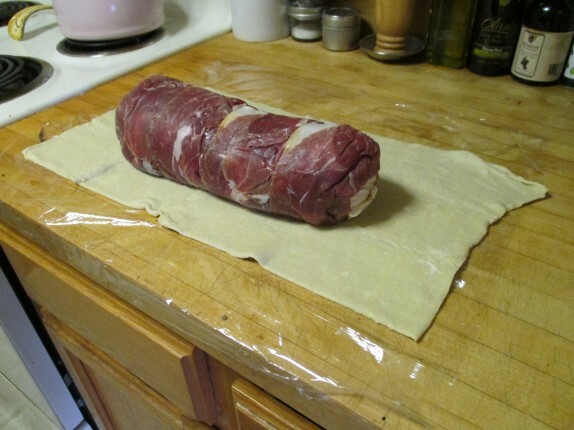 By shielding the puff pastry from direct contact with the tenderloin vis-à-vis a layer of mushrooms and proscuitto, the meat draws in as much seasoning as it needs from these components and doesn’t sog up the pastry. 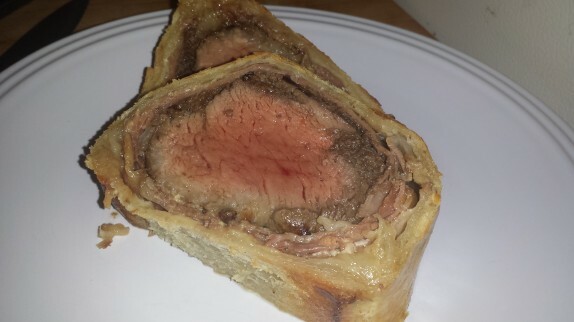 Also, by wrapping the beef in so much mass, it cooks in an indirect fashion, so how much of a sear you start with at the beginning will be the biggest factor in dictating how done the roast inside is at the end (baking the pastry is a limiting factor, since it’s basically done baking in 20 minutes). This is definitely something I’d do for a nice dinner. Like I said, it seems difficult, but it really isn’t.